Aw, thanks for all the awesome comments! When I picked Limerick as my project, I really, really REALLY didn’t think I was going to finish within the time – just ask Jen or Megan! Now I feel like I can tackle just about anything, and isn’t the the whole point? Anyway, onto some brand new content. I’ve got a lot to talk about today! I finished spinning up my neapolitan roving, and I now have four skeins (one is a bit smaller than the others) of navajo-plied merino goodness. The far left skein is the first one I did; I think it has longer repeats of the colours so it should stripe at smaller stitch counts. I’m planning to swatch some of this as soon as I’ve set it. In other spinning, I spun up my very first skein of ingeo. The first time I tried spinning it was on the drop spindle, and that didn’t work out too well – I was a rank beginner then, too. Now that I’m not-so-rank and have the wheel, it worked out pretty well! The first photo here is from my old reliable camera, following two are with a newer camera that I’m still figuring out. The skein weighs in at an almost perfect 110 yards, and about, oh, 3.5 ounces? Silly me didn’t save any of the fibre for blending, but I’m sure I’ll pick up more at some point. It’s really quite shiny and pretty, the structure is really well defined as well. I’m still a bit iffy on the feel – it’s soft, but it is kind of that synthetic softness. Up next, some straight soy silk. A Charlotte’s Web shawl, using Jaggerspun wool/silk worsted weight. It’s a lot bigger than in that photo now, and quick to knit too (big needles + holes = fast)! Ooookay, I think that’s everything for today! Off to the wheel. Not only did you finish Limerick, you had to reknit several parts! I meant that as astonishment that you were able to knit even more than Limerick in 16 days. Wow, your sweater is just whipping along! 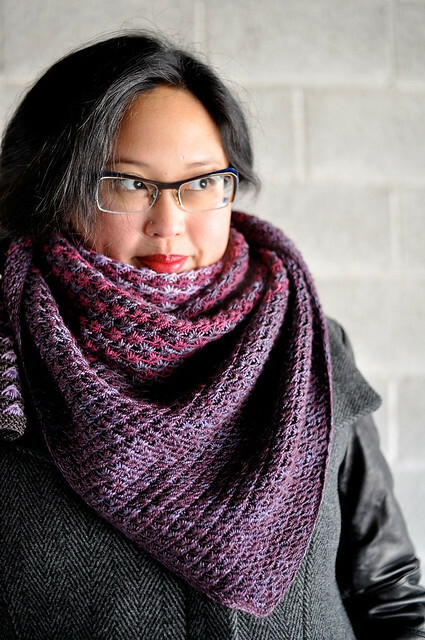 And the solid-colored Charlotte’s is a great idea – can hardly wait to see if off the needles. Isn’t it nice to work on something other then an Olympic project? I am so glad to be onto something new. The spinning looks lovely Laura! your neo spun is just beautiful!!! I have been visiting your site more and more regularly. You are an amazing knitter. You are very quick, and you pick great projects. I am also enjoying your pics of “your” spun yarn. Speaking of spinning yarn… I just started learning last night on a drop spindle. Did you find that the wheel was easier for you? Because I didn’t take the drop spindle as much as I thought I would. I really, really like your dark Charlotte…so cool, I’ve never seen one like that.